SPIDER-MAN, 2002. Original vintage DS and unfolded 1 sheet (27″/40″) movie theater poster starring; Tobey Maguire, Willem Dafoe, Kirsten Dunst, director Sam Raimi and writers Stan Lee and Steve Ditko. 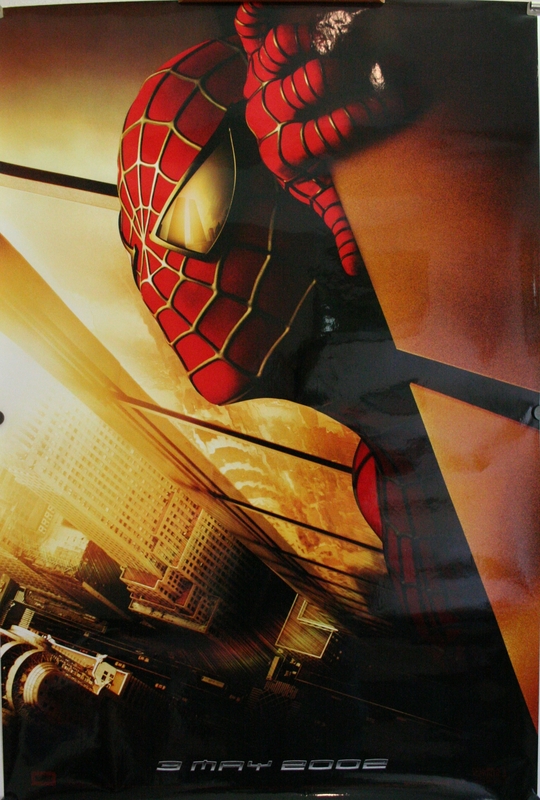 This poster was released prior to September 11th, (911, 9/11) 2001 and was promptly recalled after the national tragedy due to the reflection of the Twin Towers in spider-man’s eyes. There are three variations of this poster: the rarest contains “2002” at the bottom, the second rarest contains “Coming 2002” and this version is the third rarest of the recalled posters containing “3 May 2002”. The principal technique for authenticating this poster is identifying in the lower left quadrant of the, along the margin, a taxi cab. This poster DOES contain the taxi and the ones that do not, are fakes. Also keep an eye on the level of gloss. An original is highly glossy. For more information <CLICK HERE>. This poster is in wonderful near mint condition and is a perfect piece for investment purposes.